Louhi Review 2019: Is Louhi a Good Hosting? Louhi is an award-winning Finnish web hosting provider with over 22,000 business and consumer customers, 97% of which are satisfied with its services. Initially conceived in 2001 as a small side business, Louhi was officially registered as a full-fledged web hosting company in 2005. 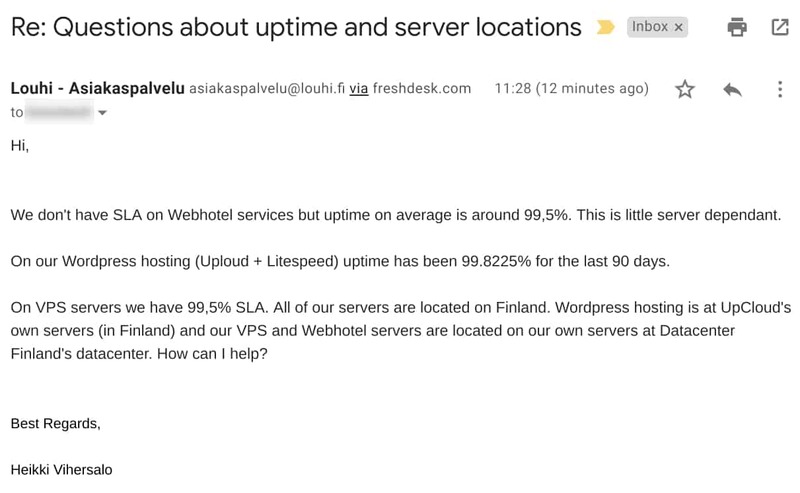 The Finnish company provides “domains, websites, and business applications for professionals, all at affordable prices.” Well, they say so themselves, so let’s look to see if they’re right. Analyzing the information on the Louhi website is easy because it can be switched quite simply from Finnish into my native English. In addition to its standard hosting plans, this provider also offers WordPress-optimized plans. I’ll focus on the former, while referencing the latter where necessary. The standard hosting plans – imaginatively titled “Louhi Hosting” – are Mini, Perus (meaning Basic), Rajaton (meaning Unlimited), and Voima (meaning Power). Resources range from 0.5 GB disk space and 10 GB traffic (on the Mini plan) to 20 GB disk space and unlimited traffic (on the Power plan). Where the specific resources are not unlimited with your chosen plan, you can top them up by purchasing additional disk space, traffic allowance, and email accounts. Note that backup recoveries are an additional charge as well. Louhi has a 99% uptime SLA for virtual servers, with this figure bumped up to 99.5% in higher-tier plans. There is no such uptime SLA for shared hosting but you can expect an average uptime of 99.5%. Customers on the WordPress plans have enjoyed historic uptime of 99.82% over 90 days. When it comes to pricing, you get what you pay for, or (in this case) you pay for what you get. Beginner webmasters with simple HTML websites can get started for single-figure dollar prices per month. In contrast, power users on the aptly-named Power plan for what Louhi terms “demanding use” will pay about 20 times as much each month. Since there are no obvious incentives for signing up for longer periods, I’d suggest signing up for the three-month minimum, at least initially. Note that if you’re registering for the entry-level Mini plan, you’ll have to go for at least a one-year contract. Private customers get 14 days to change their minds, and everyone gets one free domain with any hosting plan. Louhi’s main website includes a set of FAQs and a link to the separate Support Site that contains a link to live chat (which was offline), a large number of articles, and a support ticket submission form. You can also contact this company by email or telephone, but support times are limited to working hours on weekdays. Louhi provides a range of appropriately-priced standard and WordPress hosting plans, complemented by additional offerings including G Suite, Office 365, and Hosted Exchange. They’ve got “award-winning customer service,” even if they do say so themselves, but surely their 97% satisfied customer base can’t be wrong. Wondering how Louhi stacks up against other Web Hosting companies? Enter any other Web Hosting company and we will give you a side-by-side comparison.